Since 1966, the U.S. 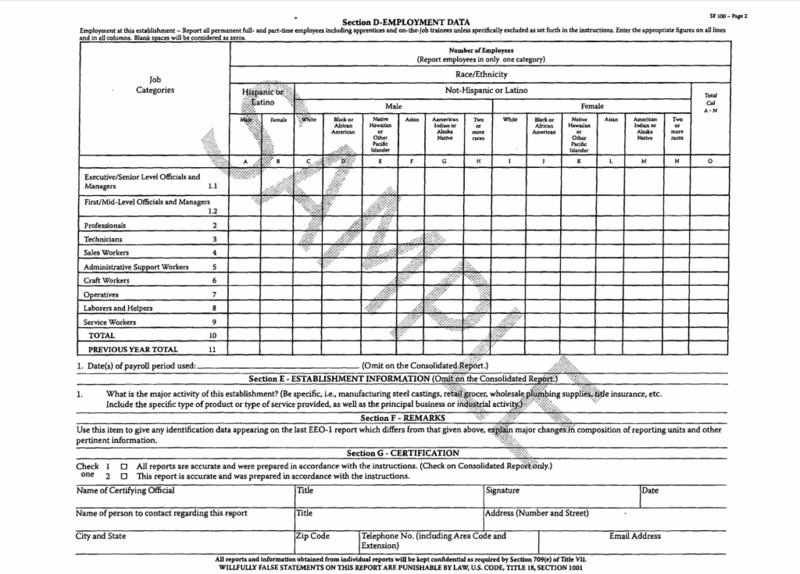 Equal Employment Opportunity Commission has required that employers with one hundred or more employees file with the EEOC the “Employer Information Report EEO-1”. In 2017, there were plans to have employers provide employee pay data as part of the EEO-1 filing. But, that new reporting requirement never came to fruition. Instead, about a year and a half ago, I blogged here about the White House Office of Management and Budget nixed the new reporting requirement. Then, about a month ago, I blogged here about a DC federal court decision which brought back the pay-data reporting requirement. A few weeks ago, I wrote here that the court gave the EEOC until April 3 to tell employers if they’ll have to report pay information in this year’s EEO-1 reports. If you head over the EEOC’s EEO-1 page, the current EEO-1 deadline is May 31, 2019. Will you have to provide 2018 pay data? When will be the new EEO-1 deadline? Read the instructions. Presumably, these will be updated soon with information on how to provide employee pay data.